My first trip with Old Town’s Topwater 120 Compact Kayak came about something like this. I had a surprise for Butler. In the days leading up to the trip, I received one of the first Old Town Topwater 120s. When I showed up with the new kayak in the truck, Butler, an Old Town team angler, was stoked. He’d only seen the teaser videos floating around the Internet leading up to the big reveal at this year’s ICAST show. For years, fans have been waiting for Old Town to fill a hole in their lineup with a compact, standup kayak perfect for shallow, sheltered waters. Snakehead live in narrow, muddy creeks. A perfect application for the top secret boat. Unfortunately, the first five hours throwing hollow-body frogs only produced two small bass. On the flip side, not distracted by fish, we had plenty of time to test the new Topwater. Old Town’s designers call their first shot at a tunnel hull the “Double U”. Looking at the bottom of the boat, the two outer pontoons, separated by a keeled tunnel, resemble a “UU”. The design pushes volume away from the centerline to increase stability and reduce draft while the keel maintains tracking. This popular hull design is intended to balance stability with performance, but mostly provides a stable fishing platform with tracking and speed for short trips. Perfect for our snakehead adventure. The Topwater paddled straight as we scooted between lily paddy fields. A short waterline and softer chines were just right for navigating the vegetation-choked tidal creeks. The Topwater features plenty of secondary stability to keep an angler upright. Standup performance is the function of secondary stability. As the boat leans to one side, the chines catch before it flips. The wide beam further increases stability and reduces draft. We experimented standing on one foot and leaning hard to one side; we couldn’t flip the Topwater. The topside was equally inshore-fishing friendly. The Topwater is rigged with two gear tracks and two flush mount rod holders. A large, flat tankwell is big enough for a super-sized crate or small cooler. The padded deck is completely flat and reinforced with two scuppers. 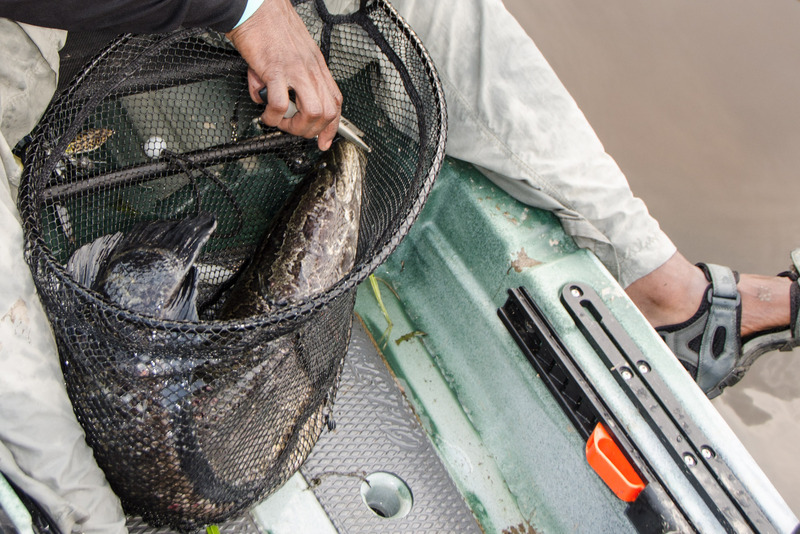 A small, dry hatch in the bow won’t accommodate rods, but it will hold lunch and a dry bag with extra clothes. Old Town included a scaled down version of their lawn chair seat. A single layer of breathable mesh offers no padding. Hey, this is a standup boat right? We didn’t spend much time sitting down. I can move the seat from the high to low position without standing up. There’s room under the seat to store a couple tackle trays, but there are no scuppers here so the area formed a shallow puddle. Another advantage of shorter boats is simply a reduced amount of plastic. 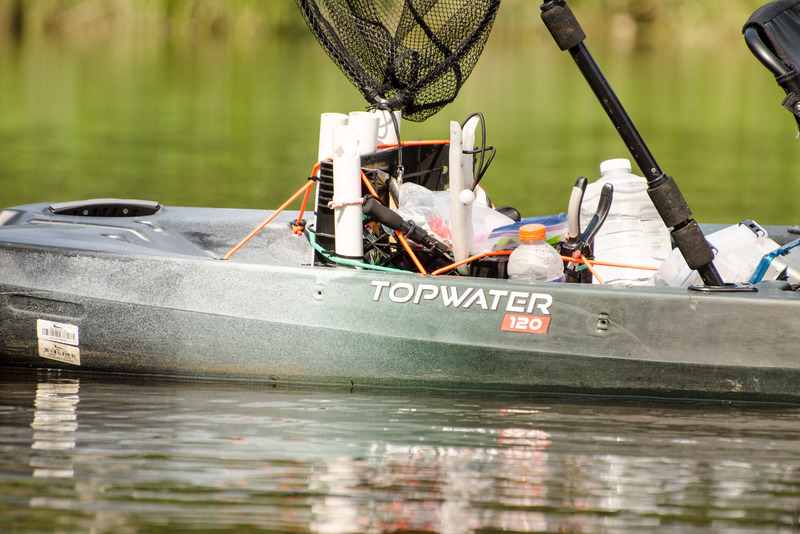 The Topwater is 82 pounds and easier to move and store than its big brothers. Minimal rigging adds to the weight savings with just enough hatches and gadgets for a hard day of backwater fishing. Add a crate and the boat is ready to hit the water. There is an enlarged scupper in the front of the cockpit for a fish finder transducer and plenty of flat areas on the gunwales to add rod holders and accessories if that’s what you’re into. We liked to keep the Topwater simple, ready for action. Simple is what the boat’s design team intended when they cooked up the new series. Shorter, lighter, simpler standup kayaks at a lower price are bringing more anglers into the sport and encouraging current kayak anglers to add another craft to the garage. However, the compact class of fishing kayaks is quickly getting crowded. Leading up to the Topwater’s release, Old Town lured anglers with a series of intentionally vague online videos. Frustrated with the teasers, I went to David Hadden, brand director, for some answers. “The Predator series has been a huge success, but we needed something smaller in size and easier to transport,” he told me. With the sub-$1,000 kayak category seeing huge growth, Old Town answered with a high-quality boat for $999. The 120 will come in just under $1,000, a 10-footer costs $899 and the Topwater PDL pedal version stays below $2,000. We had a great time paddling the Topwater 120, but I was most anxious to pedal the Topwater PDL. “The larger category that will present itself is a new generation of sub-$2,000 pedal kayaks,” Hadden says. With foot-powered fishing machines still selling like hotcakes, Old Town’s tried and trusted PDL pedal system will set a precedent for other companies hoping to drop their pedal system below two grand. 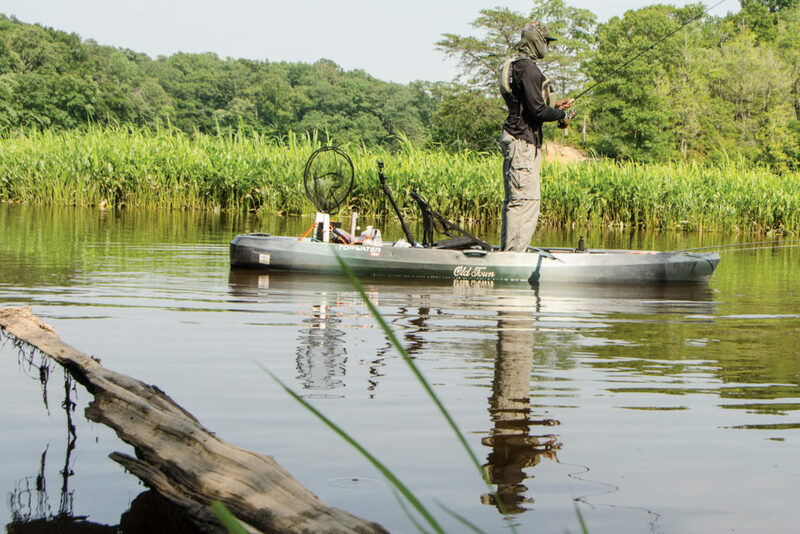 Back on the snakehead hunt, the compact-kayak craze made sense. The comfort and handling reminded us of higher-price backwater boats, while the absence of excessive gear tracks, hatches and other accessories recalled the boat’s value-minded pedigree. With all the mud and swamp cabbage we were churning up in search of the illusive snakehead, I was glad not to have to clean a bunch of hardware at the end of the trip. As the tide dropped, water drained from the thick vegetation leaving the snakehead nowhere to hide. With the setting sun blazing yellow, Tex hooked his first snakehead. The prehistoric river monster sucked down a topwater frog. When Tex scooped it into the net, we celebrated with whoops. “I don’t like the way it’s looking at me,” Tex shuttered as he tried to pry the hooks free. On cue, the three-foot-long curl of muscle kicked and flipped into the air. Terrified, Tex recoiled giving the snakehead a second to twist over the side of the boat and into the water. We screamed and cursed in unison, then laughed at the tragic irony. A loud splash further down the creek ended our lamentations. Snakehead were coming out of the swamp like a zombie horde. The bite was on. Adventure was ours.